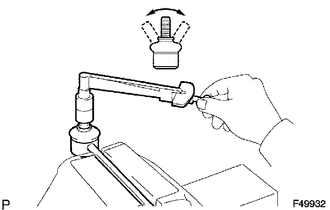 (a) Move the ball joint stud back and forth 5 times before installing the nut as shown in the illustration. (b) Using a torque wrench, turn the nut continuously at a rate of 3 to 5 seconds per turn and take the torque reading on the fifth turn. If the turning torque is not within the specified range, replace the rear stabilizer link assembly with a new one. (c) Check for any cracks and grease leaks on the ball joint dust cover. (d) Check that neither unusual drag nor rattle occurs during rotation.